There is nothing on the back of this postcard but it seems to show a Southern Division tender frame with a boiler mounted on it. So a sort of mobile stationary boiler — if you see what I mean. Any information about it is very welcome — eg where made, where photographed, what was it to supply steam for and so on. I have seen 2 photos of similar boilers at Liverpool Downhill and Middleton, Cromford and High Peak, both dated 1963. Both have the side hinged cupboard doors on the smoke box. The few pictures of Southern Division smokebox doors, that I can find are hinged at the top rather than the sides. So does this suggest the mystery is a Crewe rather than Wolverton boiler. The 2 boilers mentioned have a tall extension chimney which I think would also feature on the mystery when in operating position. 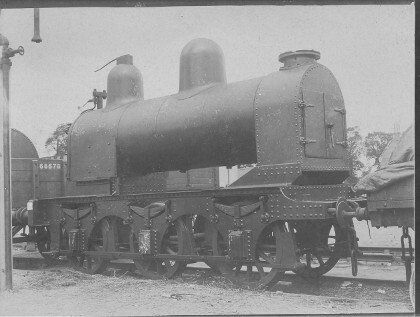 The tender frames are similar but not exactly the same as mystery 237. The frame is certainly from a standard Southern Division tender, with a 5’ 6” + 5’ 6” wheelbase. The smokebox is unlike any actual locomotive smokebox and was presumably made new and fitted when the boiler became a stationary. The date of this conversion, or rather when the boiler was mounted on this tender, would be after (perhaps long after) 1862, because the tender has a Northern Division lamp socket. An odd feature is the dome-cover which encloses the higher than normal base of the safety valve, perhaps the steam outlet was here — that mysterious fitting behind the dome? The similar stationary boiler at Middleton Top had only pop valves in the normal position, or at least it did in 1962, but from other details I don’t think this is that boiler.